Creating your own unique designer styles with rhinestone is easy now with Artistic Crystals software. This trimmed-down version of Artistic Suite V6, offers the latest rhinestone application and light embroidery features. All rhinestone features are completely functional, containing the capability to create arrays, edit rhinestone direction, and producte new vector shapes. 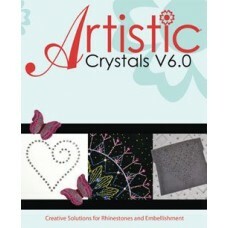 Users are able to create heat transfers from any graphicm and create rhinestone accents while using Artistic crystals. Basic embroidery is included as well, which contains outline shapes and true type font conversion.